Child's Play aims to ensure that disabled children are fully represented in its books for young children. Just like our other characters, disabled children are portrayed as good and as mischievous and as three-dimensional as any other child. Inclusion should help disabled children to perceive themselves as equal; inclusion in books allows readers who are not disabled to become familiar with characters that may look slightly different to them, or use different equipment, but are fundamentally just the same. We are not attempting to create a separate strand of children's literature tackling disability issues, simply trying to reflect society as it truly is. 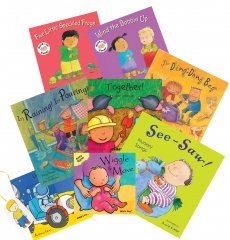 Scope's In The Picture campaign aimed to encourage publishers, illustrators and writers to embrace diversity  so that disabled children, who have been virtually invisible until recently, are included alongside others in illustrations and storylines in books for young readers. People from every area concerned with children's books  from makers to sellers to buyers - can influence and be part of this changing culture. We were lucky enough to be involved with this project from the start, benefiting from the accumulated knowledge and wisdom of the steering committee. In The Picture was initially funded for three years by The Big Lottery Fund and was managed by Scope as part of its Time to Get Equal Campaign, which is working to change the way disabled people are perceived and treated. 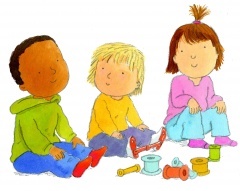 Child's Play has become one of the leading publishers to support inclusive practices for very young children and was selected as an In The Picture Champion in 2008. Alex Strick is now blogging about inclusive children's book for Booktrust. Why are we going? Will it hurt? Do I need medicine? Reading Doctor with your child is the perfect opportunity to talk about these questions, and many more! Young children’s lives are full of new experiences and these books help make them less scary.